Like Paperlink? Click here to view the entire range. 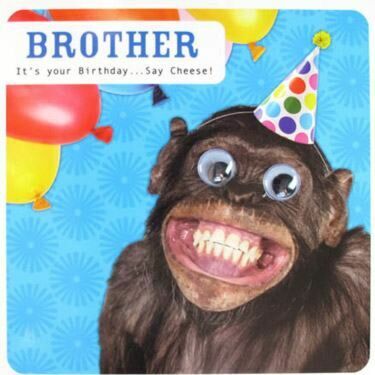 This greeting card measures 16cm x 16cm and features a monkey with googly eyes, wearing a party hat, with text that reads "Brother It's your Birthday... Say Cheese!" The inside of the card reads "Happy Birthday!" Paperlink are one of the greeting cards industries market leader of contemporary and humerous cards. Founded in 1985 the Paperlink collection has grown for all occasions, with beautiful imagery or funny cartoons there is a card for everyone!